Linda and Scott Carson on stage with Dr. David Whidbee. 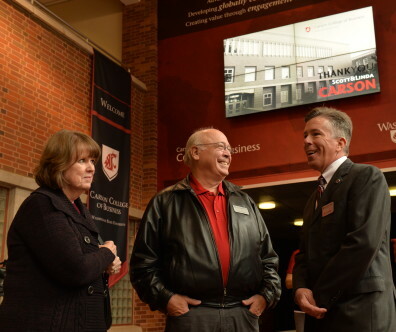 In October, Washington State University honored Regent Scott Carson and his wife Linda by celebrating the naming of the Carson College of Business. 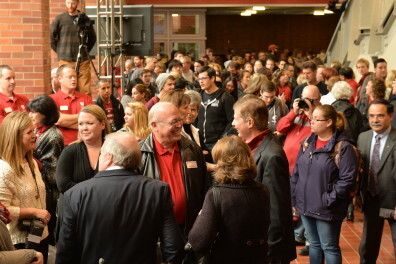 “You are the reason why we invest in WSU,” said Scott Carson (’72 business administration) said to students surrounding the stage in the Todd Hall atrium. 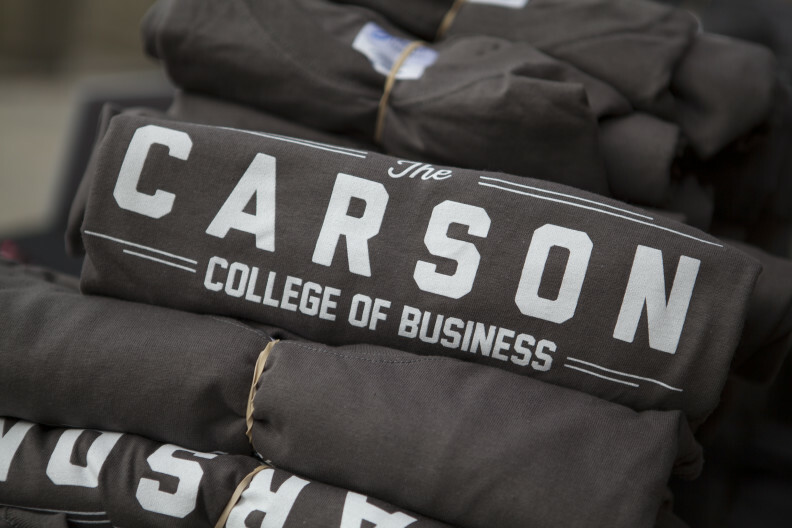 The process of renaming the WSU College of Business to the Carson College of Business was no easy task. It literally took over two years, said President Elson S. Floyd. More than 1,000 students, employees and alumni gathered in the atrium for the naming ceremony. He said he asked Scott and Linda Carson twice if the University could name the College of Business after them, and both times, the Carson’s declined, because they are not about notoriety. The third time Floyd asked, they said yes, on the condition that the focus of their philanthropy always be about students’ success. Butch sharing Carson College pride. Todd Hall underwent a dramatic transformation to coincide with the celebration. Interior walls were painted, color-coded to improve way-finding throughout the building, and new, interactive digital displays advertised the event. A floor-to-ceiling banner sporting the college’s new name hung adjacent to the stage and was a popular photo backdrop for countless students and the Carsons, along with mascot Butch. Guests took student or self-guided tour of Todd’s facilities such as the Carson Center for Student Success, an all-inclusive student services center established by the Carsons that integrates academic advising, student involvement, professional development, scholarships and study abroad into a single complex. The college also released its new website and alumni magazine in conjunction with the festivities. But the building wasn’t the only thing transformed by the Carson’s generosity. 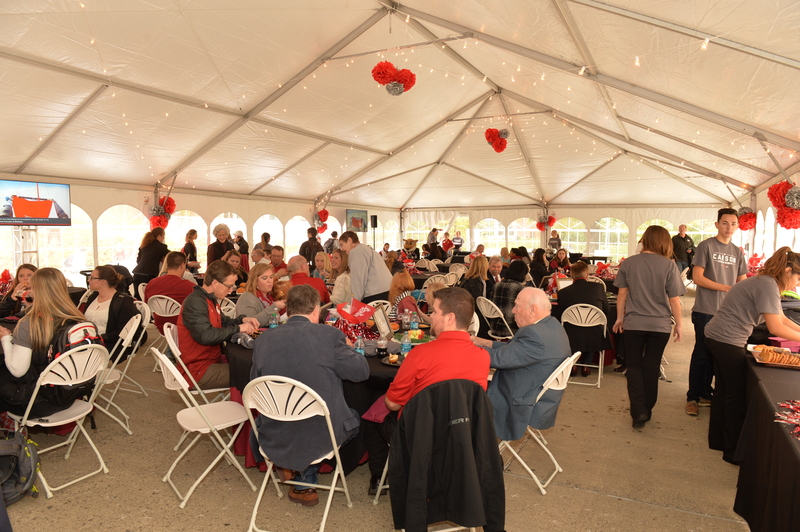 Guests dined on a feast provided by the School of Hospitality Business Management. 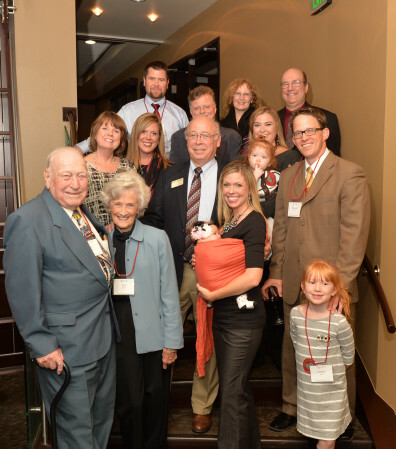 Undergraduate Kathrine Hagen spoke about the impact of the Carson Family Endowed Scholarship she received. “I’ve grown from the diversity within the college, completed challenging projects and have a great job thanks to the opportunities in the Carson College,” Hagen said. She plans on becoming a forensic accountant and earning her doctorate in economics. Four generations of the Carson family attended the naming festivities. Graduation with distinction was the highlight of attending the WSU business program, Scott Carson said. “The experience salvaged my life. Without any question, I was previously on a confused path,” he said. “I had low self-confidence and aspirations, but the success at WSU changed that and gave me the tools and foundation to be successful. “You look at that and realize you have to invest in something that has that kind of impact on you,” he said. Scott Carson earned a bachelor’s degree in business administration in 1972. He retired as executive vice president of Boeing and president and CEO of Boeing Commercial Airplanes, where he had responsibility for the company’s commercial airplanes programs and related services; these areas in 2008 generated revenues of more than $28.2 billion. 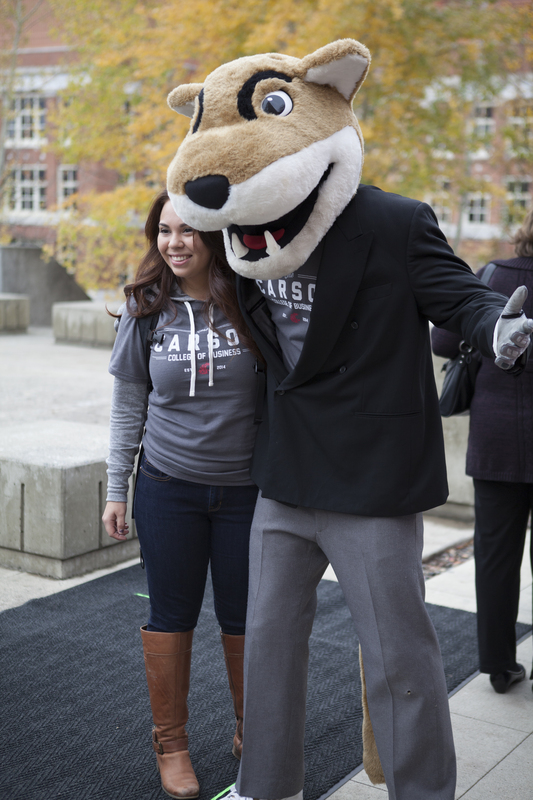 He is in his second term as a regent of WSU and is chair of the $1 billion Campaign for Washington State University. He serves on the WSU Foundation Board of Governors, is past chair of the WSU Carson College of Business National Board of Advisors and served on the advisory board for the Voiland College of Engineering and Architecture.